Shown is the fire-damaged substation on Dunlap Road. 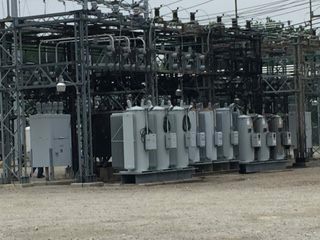 Nearly 6,000 Highland County residents were without electricity Saturday morning after AEP’s Dunlap Road substation suffered fire damage. According to Highland County Sheriff Donnie Barrera, the outage could be long lasting. The sheriff’said AEP officials were on the scene working to repair the damage. The sheriff said officials he spoke with were hopeful that parts of Hillsboro might be restored later Saturday, but it would likely be 24 hours before all customers are restored. “The substation burned up on Dunlap Road,” said Barrera. He said the cause of the fire was unknown. The fire broke out around 6 or 6:30 a.m. and “took out about nine transformers,” said Barrera. “They’re bringing in crews to rebuild or whatever they have to do,” said the sheriff. Check back for updates at timesgazette.com and on The Times-Gazette’s Facebook page.